Described as an�apocalyptic folk lo-fi songwriter, Herself is a personal project for Italy-based musician, Gioele Valenti. 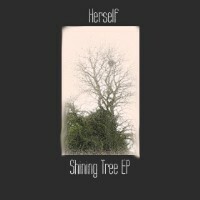 With droning vocals, mellow acoustic strumming and a whole lot of melancholia, the Shining Tree EP is perfect for those who love their music dark and gritty. Much like listening to an indie folk version of Johnny Cash, the compilation features 4-tracks that revolve around a quiet tension. The tracks for the compilation were recorded in part from the singer’s home as well as the studio. Perfect for those daytime reveries, the Shining Tree EP is made for those who love their music slow and numbing. The album floats like a ghost in an empty house with all the quiet guitars and whispery vocals. It opens with a cover from Danger Mouse and Sparklehorse, Everytime I’m With You. Transforming the track into a darker piece, Herself’s version eliminates the reflective-vibe from the original and instead dwells more on the mood of the singer. �Outside the Church is the closest upbeat single you can get from the album. It features more prominent guitars which are complemented by smokey chorus vocals and handclaps. Tempus Fugit, meanwhile, finishes the short EP. It carries the same atmosphere as the previous tracks but sees the artist incorporating violins this time. If you want something to foster your melancholia, you can’t go wrong with this compilation. It carries a gorgeous sound that’s hard not to like especially since we’ve all experienced what it’s like to be down in the dumps. Take a listen and make sure to download it.